Nexus 6P is the latest android smartphone from Google and Huawei. Nexus 6P (Verizon) recently received NUF26N Android 7.1.1 Nougat firmware update and many of you probably updated your device by flashing official factory image. Now If your device is Updated (to Android 7.1.1 Nougat NUF26N) and you’re looking for a tutorial to root the Nexus 6P. Here in this tutorial we’ll show you how to do that in simple and easy steps. All you need is Nexus 6P, USB cable and a PC with internet connection of course. You can easily root your Nexus 6P (Verizon) using below guide. After gaining root access on your Nexus device you’ll be able to do lots of stuff. There are various benefits of rooting Android devices including ability to access system files, can over clock or under clock with the help of kernel or app and many more. 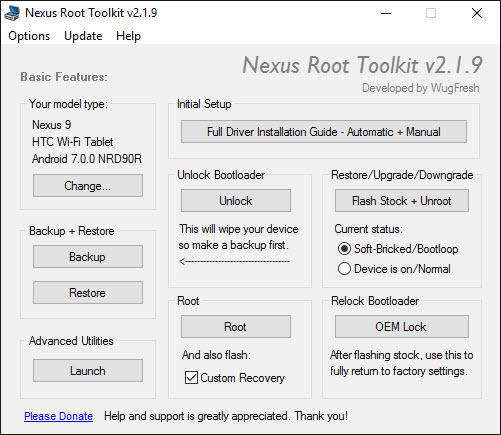 We are going to use a tool called Wug’s Nexus Root Toolkit v2.1.9. With this amazing Useful tool you can do these things. Flash a custom recovery like CWM or TWRP. Use that recovery to flash a Superuser recovery zip. Whenever you are tweaking your Android device first of all, always Backup your device data. Ensure that your device is charged more than 60%. Downlod and install USB Drivers for Nexus 6P (Verizon) in your PC. Enable USB Debugging otherwise you won’t able to transfer file between PC and your Nexus 6P. Using USB cable Connect your Nexus 6P (Verizon) To Computer. Options[Hotkey Ctrl+k] > Root Options > Superuser Options > Enable ‘Utilize SuperSU by Chainfire’ > Enable ‘Utilize Latest Beta Version Available’ > Press ‘Ok’ to apply your settings. Next click on big Root button to start rooting process. Just follow the on-screen instructions and That’s it! In the next few minutes Nexus 6P running on latest Android 7.1.1 Nougat NUF26N will get root access. You can use the same tool to install custom recovery. If you have any queries just drop a comment below.